Joanna Tovia added this to Under Cover: Which Pergola Is Right for You? Alternatively, bamboo shading adds a textural element to a casual outdoor living area and can deliver the shade you’re looking for without busting the budget. Repairing the deckWHAT YOU’LL NEED: A claw hammer, timber and nails. HOW TO: If your deck has a rotten or damaged piece of timber, it’s a fairly easy job to replace it. First use a claw hammer to remove the nails and then lift out the damaged piece. It’s usually best to remove the entire piece rather than just cutting out the damaged section. Most decks use standard-sized timber, so a replacement piece should be easy to find at a timber yard or large hardware store. Nail the new piece into position using two nails at each joist. If any nails are sticking up on the deck, now is the time to hammer them down. Finish by giving the deck a good clean, followed by an oil or stain.AVERAGE TIME: 45 minutes. 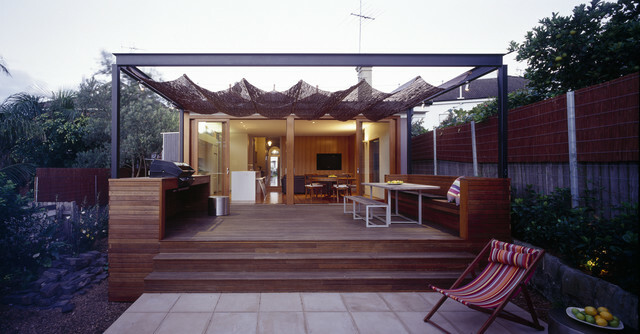 Temporary shade Many homeowners are happy to put up a temporary awning or sail over a simple pergola to shade their outdoor living areas in the warmer months, taking them down when the weather cools. Materials to use for this include sailcloth, canvas, muslin, polyester, garden shade cloth, rattan or bamboo blinds.PROS: Temporary shades are cheap and versatile. They add a lovely casual feel to a garden.CONS: Many lightweight materials are not particularly durable, nor are they wind- or water-proof. Maybe this over drive for leaves and shade?